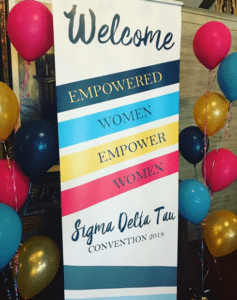 Sigma Delta Tau’s 2018 Convention in Cleveland, Ohio, has come to an end. However, the work of the chapter leaders, members, and volunteers has only just begun. This year’s convention discussions were on how empowered women can empower women. Which one of the amazing women who joined us this weekend empowered you? 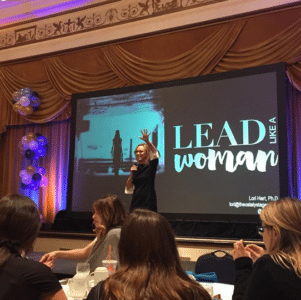 Was it one of our three keynote speakers – Jess Gendron Williams, Annalise Sinclair, and/or Dr. Lori Hart – or perhaps one of the Collegiate Leadership Team members who led your team or presented to you? Could it have been one of the collegians in your team, a volunteer who presented to you, or maybe someone you work with like a chapter advisor, president or committee member? If you’re anything like me, maybe it was the leadership of our national board and chairwomen who inspired you to achieve more? I hope it was many of these, because every one of you are amazing women who made this convention a success. The convention curriculum was designed to help you identify what you are capable of, the leadership strengths you have, and the knowledge you bring to the organization. It was intentionally challenging you to think bigger. Challenging you to identify opportunities for improvement, threats to our organization and member’s safety, and change that is needed for today’s college environment. Most importantly, the curriculum was intentional in empowering you and helping you know that, as a strong empowered woman of Sigma Delta Tau, you are capable of making big changes. You should be confident in your ability to make an impact! Change is hard but now more than ever it is needed in the fraternity and sorority community. Many people fear change because it is a disruption to our everyday process. Change as a noun is literally defined as “the act or instance of making or becoming different.” However, a recent article I read stated that “the fear of disruption can be more damaging that than actual disruption.” It is important to start the process of change with a thoughtful review of the sustained advantages you have already built. Review the things you are capable of as a leader or organization, the value of your brand as a leader in the organization or as an organization in the community, and the relationships that you have built with your partners. Then focus in on investing in areas where you have strengths. Those areas will give you the flexibility you need to survive and thrive amid disruption. A disruption could be change in the climate of our industry, like the change to the taxi industry when rideshare companies became increasingly popular. You would probably agree that, had the taxi industry been more attentive to its customers, it might not have been threatened at all. We too as sorority women and leaders can learn from this and work in a preventative way to ensure organizational success. If we are more attentive to our members and stakeholders, the disruption from change might not be seen as a threat at all. There are several options we can take to approach the future of our organization. Understanding our capabilities is extremely effective for knowing how to react. So many leaders are ready to believe that agility, whether operational or strategic, or even no reaction at all, is the best response to disruption. “Often, it’s because of natural cognitive biases: People tend to overestimate the power of a threat and underestimate the time they have to respond” (Mainardi, 2017). The disruption in the fraternity and sorority community right now is one that we need to respond to and we cannot underestimate the urgency of this response. We cannot have a fear of this disruption because apprehension can lead some organizations into a state of strategic paralysis. Some organizations hold “cautiously to business as usual and avoiding risk. Their lack of confidence appears to be linked to a lack of self-awareness; they don’t appreciate their own strengths enough to double down on them and make them viable” (Mainardi, 2017). As an organization and its leaders, we need to have a self-awareness of our capabilities, understanding our strengths and being confident in their ability to help us respond to this needed change. It can be easy for organizations and leaders to move without regard to their core strengths, but these moves are less likely to be effective. Making too many moves without regard to our strengths can become a distraction, exhausting our resources and taking time and effort away from more productive strategies (Mainardi, 2017). At the end of our Convention, Dr. Lori Hart discussed that we cannot let social media infractions distract us from the underlying problems. Our strength is not in our ability to control what our members post on social media, but rather in our ability to connect with one another on a personal level. So don’t exhaust all your resources on an extensive punishment process for social media infractions, spend more time leaning on your strengths in your ability to get your members professional help and education around their risky behavior. As an organization, the best defense to this disruption in our community is not just within our ability to have operational or strategic agility. “It is far better to create advantage through a few distinctive, deeply ingrained capabilities that allow you to deliver on your value proposition better than anyone else. Although it may take years to fully build them out, significant results will begin to appear much more rapidly” (Mainardi, 2017). Sigma Delta Tau has the opportunity to leverage our heritage to deliver our value proposition to members and stakeholders. Our heritage is a strength of our organization if we invest in becoming self-aware of the history of our organization and the initiation ritual, this strength will make our organization more distinctive and meaningful to our members. The benefit of honing in on a few distinctive capabilities based on our strengths is that we are able to make them quickly enough, and incorporate enough feedback, to course-correct as we go along (Mainardi, 2017). Jessica Ryan was recently awarded the Sisterhood Service Award at this year’s convention. 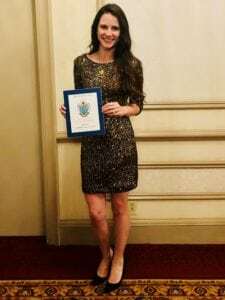 She serves Sigma Delta Tau in many capacities as a National Council volunteer, most recently serving as the Collegiate Programming Chair on the Convention Team. She serves as a Recruitment Coordinator, Chair of our Alternative Spring/Summer Break Program, she is a part of the Strategic Planning Team, and is a past SDT Foundation Trustee. Originally from Florida, she graduated from the Gamma Eta chapter at the University of South Florida and has a M. Ed. from the University of West Florida. She now lives in Philadelphia, Pennsylvania, with her husband and two and half year old son, and works in the Office of Fraternity and Sorority Life at the University of Pennsylvania as the Associate Director for Leadership & Experiential Learning.